Goggles were created to provide their users with comfort during winter sports. Goggles protect the eyes from cold, snow and harmful UV radiation. They have double lenses that create a thermal battery and prevent condensation. The special ANTI-FOG coating prevents evaporation. 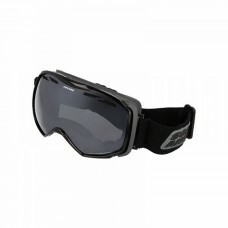 Goggles are designed for your appearance on the slope, they fit well with most helmets. Flexible adjustment makes it easier to fit the goggles to the head or helmet, the soft inner lining makes it easier to fit the face. The packaging also contains a soft case. Goggles are designed for skiing, snowboarding and other winter sports. The goggles are not intended for swimming. Do not use them in water, do NOT use for motor vehicles, DO NOT use them for indirect observation of the sun and as safety goggles for industrial use. The goggles are not designed to protect any objects from splashes. Keep the goggles in a clean and dry place, in a box and in a protective case. Do not put damp goggles into the case and dry them near heat sources or expose them to temperatures exceeding 50 ° C. Never use goggles if the frame, strap or strap is damaged. After each fall or impact as well as after a long period of storage, check that all elements of the goggles: fast, binding, foam elements or strap are in good condition. The glasses are covered with a special, delicate anti-fog coating. Only clean the glass with a soft, clean cloth. Make sure that the cloth is clean and there is no dirt that can scratch delicate glass. Do not use alcohol for cleaning.